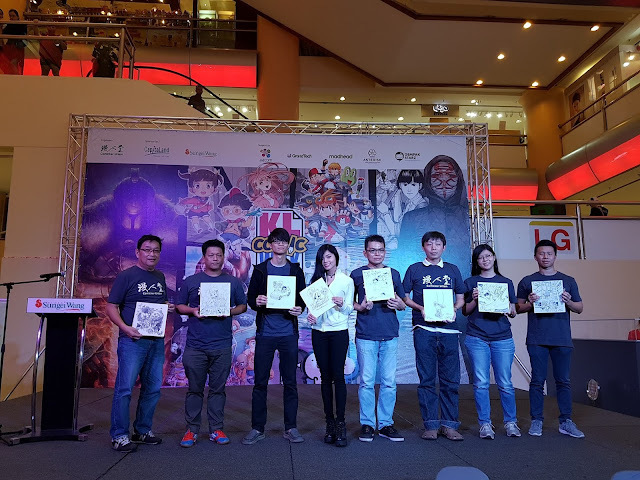 The first Chinese comic events is coming in the heart of Golden Triangle and it will be the largest avid comic reader gathering in Malaysia. Organised by Comiker Union, sponsored and presented by Sungei Wang Plaza and CapitaLand Malaysia Mall Trust (CMMT), the inaugural “KL Comic Week 2016” will be happening from 3 November to 6 November 2016 at Concourse Level, Sungei Wang Plaza. There will be more than 30 professional Malaysia Chinese original comic artists congregating “KL COMIC WEEK 2016”. Apart from promoting the fun and originality of comic spirit, Comicker Union is also proactively promoting the interaction of both local and international comic culture and boost local artists’ talent. Witness the talent and skill of Hong Kong thriller comic master, Master Sam Tse, the author of “Hong Kong Infected”, who will be making a special appearance to share his view and ideas on comic culture and interact with local comic artists and fans. A total of 20 professional comic artists will be invited to create an 8-page short comic based on the theme of “英雄 HERO” on 5 November 2016 located at 2nd Floor of Sungei Wang Plaza, within a limited time of 8 hours. This activity is aimed to enable the public and readers to understand more about the process and creation of comic drawing. Come and witness how these talented artists rise to the challenge to come up with a winning comic and their works will be on display at the stage area on 6 November 2016. There will be three exhibitions held at 2nd and 3rd Floor concurrently “Dark Souls” by Alan Quah, “Hong Kong Infected” by Sam Tse, and “Office Survival” by Michael Chuah. *Dark Souls, published by TITAN COMICS, adapted from NAMCO BANDAI popular video games. *Hong Kong Infected, Master Sam Tse latest thriller type comic. *Office Survival, Michael Chuah teacher using the office environment as the theme writing in humour four-frame comic. A number of originality comic artists in Malaysia will be setting up booths and promoting their respective original works. In addition to the originality comic promotion, there will be other offerings such as comic portrait sketching services, animation training workshops and electronic drawing workshops for readers and amateur comic writers. A total of 15% from the sales proceeds will also be allocated to selected charity foundation to help children with serious illnesses. Not only that, a number of renowned comic artists who are active in different genre will also be invited to showcase their works. In addition to the above-mentioned theme exhibition and the 8-hour challenge, there will also be several senior comic artists taking turn to share their creative experiences and present their skills on-stage live. * Zombie COSER walkabout will be appearing from time-to-time.